Stiff competition and fragmentation prevail in the global food hydrocolloids market. In this market with a large number of local and regional players, key players have resorted to product innovation, investments, and acquisitions to gain competitive advantage. The food industry has been displaying a surging demand for food hydrocolloids predominantly on account of its functional properties. The increasing uptake of ready-to-eat meals is the key factor having a positive impact on the food hydrocolloids market. In present times, the increasing complexity in consumer dynamics due to professional and personal commitments does not leave adequate time for fresh cooking on a regular basis. This, in turn, is displaying an increased demand for ingredients used in food products such as hydrocolloids. Proving a roadblock to the growth of the food hydrocolloids market is the use of conventional ingredients from the regional food industry. As per a report by Transparency Market Research, the global food hydrocolloids market is likely to expand at a CAGR of 3.6% between 2017 and 2025, for the market to be valued at US$7,634.0 mn by the end of 2025. The segments into which the global food hydrocolloids market is classified based on source type are plant source, microbial source, seaweed source, animal, and synthetic. Amongst all, the segment of plant source is expected to hold 37.4% of the overall market by the end of 2017. In terms of function, the segments of the global food hydrocolloids market include thickener, stabilizer, emulsifier, gelling, coating, and others. Thickener, amongst all, is expected to lead the market over the forecast period. The segments of the global food hydrocolloids market based on application that are covered in this report are bakery and confectionery, meat & poultry, sauces & dressings, beverages, dairy products, and others. Amongst all, bakery and confectionery is anticipated to display the leading CAGR of 4.8% between 2017 and 2025. This will be followed by meat and poultry at a CAGR of 3.6% over the forecast period. 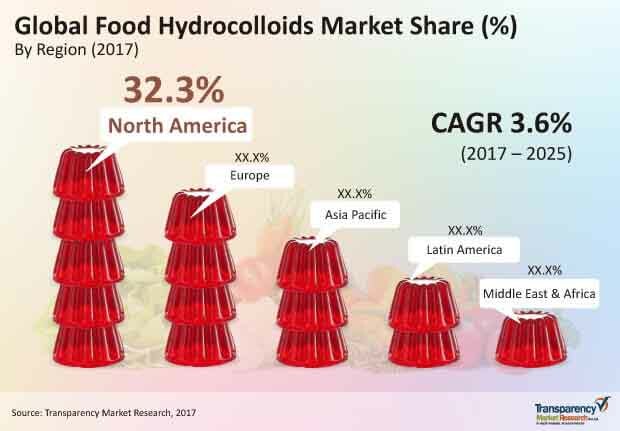 The key segments into which the global food hydrocolloids market is divided based upon geography are North America, Europe, Latin America, Asia Pacific excluding Japan, Oceania, Japan, and the Middle East and Africa. North America presently holds supremacy in the global food hydrocolloids market. The regional market of North America is expected to expand at a CAGR of 4.0% between 2017 and 2025. Progressing at this pace, the region is expected to gain significantly vis-à-vis revenue by the end of 2025. Asia Pacific is expected to display 3.6% CAGR between 2017 and 2025. The increased concentration of product manufacturers in the developing countries of Asia Pacific accounts as one of the key factors for the growth of this region. The rising working class population in the region that is increasingly adopting convenience foods to match their busy lifestyle is displaying demand for functional ingredients that are used in these foods. Thus, the market for food hydrocolloids is benefitted. Latin America and the Middle East and Africa are expected to trail Europe with respect to growth rate over the forecast period. Some of the prominent participants in the global food hydrocolloids market include De Pont De Nemours & Company, Cargill Incorporated, Darling Ingredients, Kerry Group plc, CP Kelco, Fuerst Day Lawson, Ingredion Incorporated, Ashland Inc., Koninklijke DSM N.V., Rico Carrageenan, Archer Daniels Midland Company, Hispanagar, S.A, CEAMSA, FMC Corporation, Lubrizol Corporation, Jungbunzlauer, B&V SRL, Tate and Lyle PLC and Fiberstar, Inc.